Join YPT in the deserts and oasis towns of China’s Far West! From the ancient city of Kashgar, through small Uyghur towns on the southern Silk Road, we cross the Taklamakan Desert to Turpan, the lowest city in China at 142m below sea level. The Xinjiang Far West tour starts in the historic city of Kashgar, closer geographically to Tehran and Damascus than to Beijing, a border town between China and the Central Asian states of Kyrgyzstan and Tajikistan, and the site where traditional Uyghur life hits the Chinese state head-on. We visit the old town, livestock market and main bazaar and, being YPT, can’t miss out on the huge statue of Chairman Mao in People’s Square. We check out small Uyghur towns that haven’t been developed along the Kashgar model, yet, and skirt the Taklamakan Desert as we go. On the north of the desert, we spend a day at Kuqa’s amazing Thousand Buddha caves, reminding us that before the spread of Islam southern Xinjiang was the place where Buddhism entered China. Lastly, we hang out in the Turpan, China’s Death Valley, the lowest and hottest place in China. In the countryside outside the city, it’s surprisingly green though and we wander the ruins of ancient cities and stop in a Uyghur holy village for lunch. If you’d like to see some more Central Asia while you’re here, you could join us for the Silk Road Summer Tour, which visits Turkmenistan, Uzbekistan and Kyrgyzstan as well or simply the Kyrgyzstan Independence Day and Xinjiang Combo to combine the best of these two locations and one of China’s least travelled border crossings. Stop by People’s Square and the largest statue of Chairman Mao in China! Dinner of Uyghur fried rice and mutton. Check out the night markets and street food. 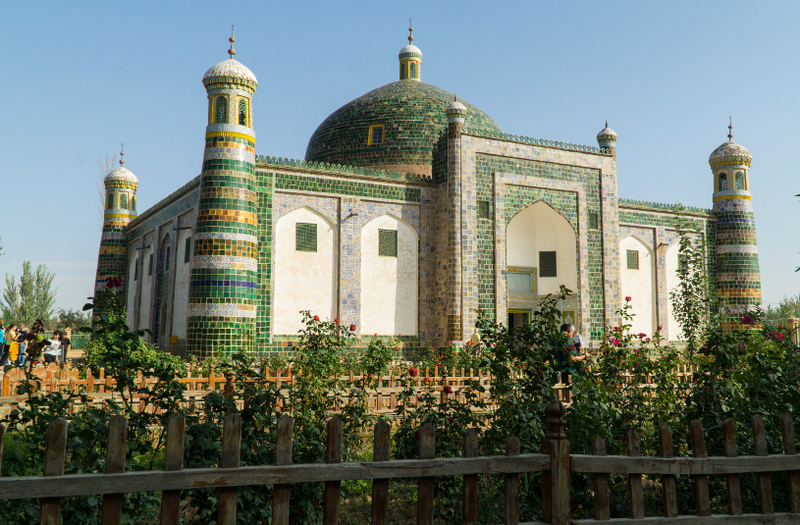 Head out of town to the beautiful tomb of Afaq Khoja: a 17th-century mausoleum of this important Uyghur figure. Browse the bustling Grand Bazaar, which depending on how you measure it, is the biggest in Asia. We’ll make a short stop on the way in Yengisar to see the handcrafted Uyghur knife factories. Then we get to Yengisar and we’ll take a stroll around the Altun Mosque complex, surrounding cemeteries and the Old Town of this Uyghur town, inhabited completely by Uyghur people. Drive back to Kashgar and we go looking for what makes a Saturday night in far west China! A leisurely start to the morning, but soon after breakfast we’ll head out to Kashgar’s famous livestock market, where the locals come to trade in cows, sheep and of course camels. Head to Subashi Buddhist ancient town, a remarkably unique place which will be a trip highlight. Catch the overnight train to Turpan, which takes about eight hours. Arriving in the morning, we’ll check in to our hotel in Turpan. Turpan is China’s “death valley”, being the lowest and hottest part of the country at 142m below sea level. Visit the Yarkhoto ruins, the site of a 1600-year-old well-preserved ancient town. Leaving the town, we’ll visit the holy village of Tuyoq, a traditional mud-walled Uyghur village beneath the Flaming Mountains. 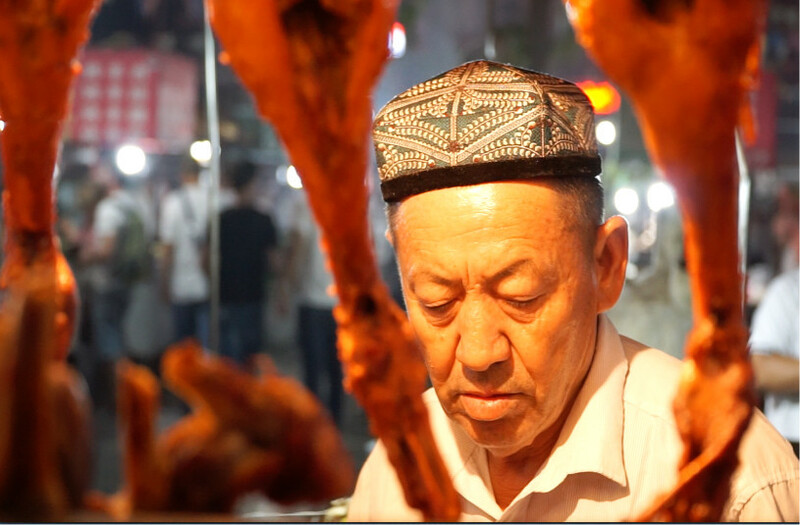 Farewell dinner in Turpan, expect barbecue, maybe a whole plate of chicken and plenty of Xinjiang beer to wash it down! Catch the fast train back to Urumqi, which takes under two hours. Arrive in Urumqi where the tour concludes. YPT can help with onward transfer for your flights home. Ramble around the bustling markets and old town of Kashgar, China’s farthest west city, which is closer to Tehran and Damascus than to Beijing! Road trip through the oasis towns of the southern Silk Road visiting towns that are entirely inhabited by Uyghur Muslims with not a Han Chinese in sight!